This Bible study is a lot more exciting than getting a paycheck and benefits...and infinitely more important. After all, you're not planning for a lifetime -- you're investing in forever. And God wants it to be great for you! Through this insightful group or individual study, Bible teacher and spiritual counselor Bruce Wilkinson clarifies how the choices you're making today are going to affect the quality of your life in heaven. Topical, conversational, and application-oriented, the question-and-answer format makes this flexible four-week study an ideal resource for the first-time or veteran group leader. About "A Life God Rewards (Leader's Edition) (#03 in Breakthrough Series)"
"Rejoice in that day and leap for joy! For indeed your reward is great in heaven." What if today really was the first day of the rest of your life? Today you make your trade&mdash;everything you have accomplished and become for whatever God offers in exchange. There you are, poised on the brink, lifetime in hand, ready to step into eternity. What a moment! And what an amazing exchange! Your blink in the sun for God's endless day. Your spoonful of water for His Amazon River. But what if I told you that the small choices you make today&mdash;like how you interact with your boss, or whom you invite to dinner&mdash;could change what happens next? In the little book you're holding, you're going to discover that Jesus revealed that our actions now will affect our future forever. Astoundingly, millions who follow Jesus seem to have missed what He said. I was. I grew up in a family that attended church regularly, and I was taught the Bible from the time I was young. Later I spent nine years pursuing theological training. But the clear teachings of Jesus on this subject remained lost to me, like overlooked treasures in my own house. When I finally discovered them, many things started to make sense for the first time. through a keyhole at the night sky, trying to hold on to our tiny patch of stars. But the keyhole is so small and the view is so great. Jesus wants to open the door and show us more. No one made more shocking statements about the afterlife than Jesus of Nazareth. His teachings often left His audiences amazed, dumbfounded, even outraged. Take His first public appearance at the age of twelve: "All who heard Him were astonished at His understanding and answers" (Luke 2:47). Rejoice in that day and leap for joy!" You might know these verses well. I have to confess that I read them dozens, if not scores, of times before I really read them. Jesus' statement seems incredible, doesn't it? I used to think He was saying something like, "If you are persecuted on My behalf, you'll be so happy that you'll jump for sheer delight." "For indeed your reward is great in heaven." In those eight words, Jesus reveals why you and I can rejoice, even in the worst circumstances. Why? Because there is a direct connection between something you do for Him on earth and something "great" He will do for you in heaven. Notice that Jesus describes it as a reward for doing, which would distinguish it, for example, from a gift you receive for believing. Also, the reward is specifically and personally yours if you behave in one way, but is not yours if you behave in another (for example, if you ran away under the pressure of persecution). You see, Jesus isn't asking you and me to enjoy misery on His behalf. Instead He's saying that the consequences in heaven for certain actions on earth will be so wonderful that simply knowing they're coming&mdash;and knowing that they will be great&mdash;can transform how we live now. Yes, and even create spontaneous outbursts of joy! &bull; "He will reward each according to his works"
&bull; "You will be blessed&hellip;for you shall be repaid at the resurrection" (Luke 14:14). As you're about to discover, the implications of these passages are enormous. For one thing, they suggest that God is keeping track of what you do for Him every day. For another, that you have more to gain by serving Him than you ever imagined. Let me tell you how I came to write this book. In 1985 when I first stumbled upon Jesus' teachings on reward in heaven, I was startled. What He was saying seemed to contradict much of what I had always been taught and believed. So I began an intensive search for the truth, starting with every Bible verse on the subject of eternal rewards. I studied theological and scholarly works. I spent hours thinking about what Jesus seemed to be saying with such urgency. And I became convinced that spiritual seekers around the world, including millions of Jesus' followers, had mislaid a truth of great importance and promise&mdash;and it was time to get it back. Five years of in-depth study and twelve thick binders later, my findings lined the shelves of my study. One day I got a call from Dr. Earl Radmacher, president of Western Seminary in Oregon, inviting me to present my material in a weeklong graduate course at the seminary. I agreed, but only after he promised to assemble a panel of leading scholars, including some who had also been studying rewards, to sit in and evaluate every word. On an April morning several months later, I walked across the seminary campus, lugging my teaching materials. I arrived at the lecture room, which was filled with some of the brightest individuals I had ever met: department chairpersons of the Greek and Hebrew languages, church historians, Bible teachers, seminarians, and pastors from a range of denominations. Dr. Radmacher's home and debated every point. One day a church historian from Romania assured us that what we were studying was not new theology; it had been part of Christian beliefs and teaching from the first century on. To make his point he asked us, "What do the greats of church history such as Augustine, Luther, Calvin, Wesley, and Spurgeon all have in common?" When everyone hesitated, he told us his answer: "They all earnestly believed in and hoped for eternal rewards." Toward the end of the week, I noticed a shift. The roomful of scholars was spending less time debating and more time responding personally to the material. One afternoon an older participant pulled me aside. "I thought God brought me here to learn more about eternal rewards," he said, "but I was wrong. He brought me here to change my heart&mdash;I'm leaving a changed professor!" On the last day, I asked the group, "Are you convinced that what I've been teaching about rewards is consistent with what Jesus taught?" "We're convinced," they replied. And I have never looked back. In the pages ahead, you'll encounter for yourself the findings we explored that week at Western Seminary. Whether you're familiar with Jesus' teachings about eternal rewards or you're coming upon them for the first time, encourage you to read with great expectation. Important spiritual breakthroughs await you. Starting with statements Jesus made, we'll carefully construct the biggest, truest view possible of your entire life. We'll be using a lot of familiar words&mdash;words like heaven, treasure, works, and faith. I urge you to be patient as we look beneath these familiar labels for hidden insights. The teachings of Jesus show us that there are two keys that determine everything about your eternity. The first key is your belief. This key unlocks the door to eternal life and determines where you will spend eternity. The second key is your behavior. It unlocks the door to reward and determines how you will spend eternity. This second key is the focus of A Life God Rewards. Although the role of behavior (we'll also use words like actions or works) isn't more important to your future than belief, it has been more overlooked in recent times. And the promise of rediscovering the truths it unlocks is enormous, especially for followers of Jesus. In fact, by the time you're done reading, you'll approach daily life in a dramatically different way. Simple decisions, such as how you spend your time and money, will become opportunities of great promise. And you will begin to live with an unshakable certainty that everything you do today matters forever. In the first book in this series, The Prayer of Jabez, we learned that God wants us to ask for His blessing and for greater influence, or "territory," in this world. The next book, Secrets of the Vine, showed that Jesus wants our territory to produce a great harvest of good works for Him. In A Life God Rewards, I want to show you how the harvest you produce will directly impact your experience in eternity&mdash;and how that truth can change your life today for the better. I'll admit that on a subject like eternity, we must proceed thoughtfully and humbly. We're like tadpoles swapping stories of blue whales. We're like one twin in the womb trying to convince his brother that it's only a matter of time before they're both breathing air and riding tricycles. Fortunately for all of us, God sent His Son from heaven to help us see the whole truth. If you and I are willing to be surprised, unsettled, even shocked by His words, our prospects for living a life He rewards will change for the better, starting now. What you do today matters. forever! 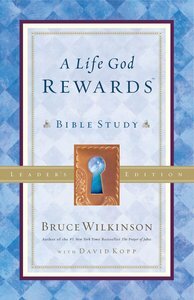 Bruce Wilkinson shows what Jesus said about God's plan to reward you in eternity for what you do for Him today. What you'll discover will unlock the mystery of God's power, plan and will for your life. This Bible study is a lot more exciting than getting a paycheck and benefits . . . and infinitely more important. After all, you're not planning for a lifetime - you're investing in forever. And God wants it to be great for you! Through these four weeks of insightful group or individual study, Bible teacher and spiritual counselor Bruce Wilkinson clarifies how the choices you're making today are going to affect the quality of your life in heaven. As you investigate key Scriptures and apply them to your own situation with this visual, interactive resource, you'll discover the most fulfilling life you've ever known. Discover how you can make praying the Jabez prayer a lifetime habit by investigating key Scripture passages with this study guide.